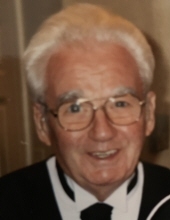 Robert E. Fitzgerald, age 95; beloved husband of the late Francis M. Fitzgerald, nee Pflum; loving father of the late Barbara Heineman, James Fitzgerald, Kathleen (Douglas) Christiansen, Robert (Rebecca) Fitzgerald, Maureen (Robert) McCormick, and Patricia (Eugene) Hess; grandfather of Denise (Dean) Norman, Elizabeth (Vincent) Tiseo, Christopher McCormick, Jeffrey (Rebecca) Christiansen, SueAnn (Eric) Reiner, Kym Hess, Kerry Fitzgerald, Kurt (Olivia) Christiansen, Amy (Dalen) Schipper, Matthew McCormick, Patrick (Amy), Rob (Sunny) Fitzgerald, and Tim Fitzgerald; great-grandfather of Carson Hess, Cameron, Rachel Konopa, Isabelle, Kyle, Ryan Christiansen, Olivia Sprecker, Jolie Christiansen, Evie Jade Fitzgerald, Bennet, and C.C. Fitzgerald, Charlie, Maggie, and Lulu Tiseo, and Ashley and Abby Schipper. Visitation Friday, 9:00 a.m. until time of funeral service, 11:00 a.m. at Adams-Winterfield and Sullivan Funeral Home, 4343 Main Street (1 Blk. So. of Ogden Ave.), Downers Grove, IL 60515. Interment, Mount Carmel Cemetery. Please omit flowers. 630-968-1000 or www.adamswinterfieldsullivan.com. To send flowers or a remembrance gift to the family of Robert E. Fitzgerald, please visit our Tribute Store. "Email Address" would like to share the life celebration of Robert E. Fitzgerald. Click on the "link" to go to share a favorite memory or leave a condolence message for the family.